More than just bling... Out of the seven SX3.5 models available from SIEG, the SX3.5DZP is the most feature rich model at the top of the range. SX3.5DZP: S is for Super. Powerful, 1000w Brushless DC Motor with Direct Belt Drive. 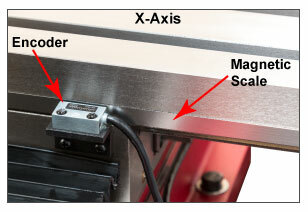 SX3.5DZP: Z is for Z-axis auto lift. The Z-axis handwheel has been abolished on this machine. Instead, a geared motor at the top of the column moves the head up and down at the push of a button. 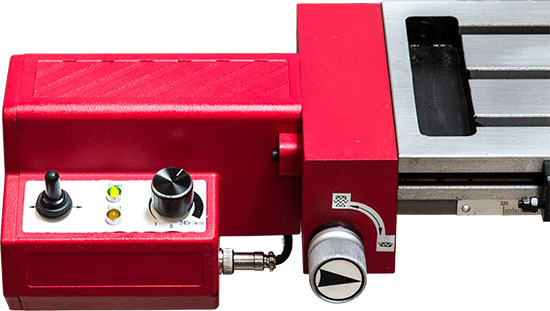 This machine is sold for hobby and light industrial use only. * 210mm with the Z-axis bellows fitted. The bottom of bellows are held in place by magnets and can be raised above the work if the maximum clearance of 230mm is required. † Spindle to table distance with quill at full extension. Most suitable for taking light cuts, with approximate feed rates of 80mm/min. (40 turns of handwheel) to 360mm/min. (180 turns of handwheel), depending on type & size of cutter, and depth of cut. Where there is a need for feed rates lower than 80mm/min. (40 turns of handwheel), traditional methods of turning the leadscrew by rotating the handwheel should be adopted, for example if greater depth of cut is required in a single pass. Alternatively, multiple passes with a lighter depth of cut and higher feedrate using the power feed would achieve similar results. In many cases, tests carried out by ARC have shown that multiple light depths of cut under power feed can still achieve the results faster or at least at the same total time required to take a deeper cut by turning the handwheel manually. With the powerfeed engaged, very light depth cuts achieve a great looking and consistant finish. The milling time and effort saved by deploying the powerfeed will make machining a more pleasurable experience. 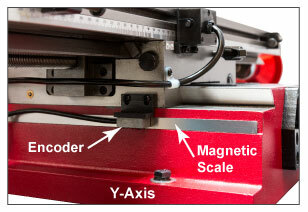 Linear magnetic encoders are built-in to all 3 axes. The photos above show the X-Axis scale is positioned on the rear of the table and the Y-Axis scale is on the left side of the base. The Z-Axis is concealed inside the column.